The Diocese of El Paso is home to three of the oldest historic missions in the United States: Ysleta Mission, Socorro Mission and San Elizario Missions. All three missions are Texas Historic Sites, included in the National Register of Historic Places, and certified by the National Parks Service as part of El Camino Real de Tierra Adentro. The missions are owned and operated by the Diocese of El Paso and managed by a parish administrator. Unlike similar Spanish colonial era missions in the United States, El Paso’s missions have functioned as the religious and social centers of their communities virtually uninterrupted since their founding in the 17th and 18th centuries making them the oldest settled areas of El Paso and one of the oldest settlements in the United States. 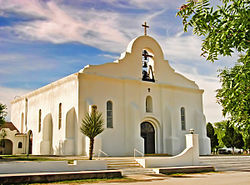 The three missions serve as living symbols of the heritage of Hispanics and Native Americans in Texas and the Southwest. The first Spanish explorers to this part of the New World celebrated the first Thanksgiving in what is now the U.S. only a few miles from the site of the missions. In many ways, this area can claim to be the original source of Hispanic life and culture in the U.S., a history and heritage that has been continuous and remains vital. The missions also serve as important heritage tourism sites for thousands of tourists who visit the Mission Valley each year. The diocese makes the missions available and accessible for tourism purposes, even as they remain the center of parish community life. The oldest of the El Paso mission churches is the Ysleta Mission, located in the community of Ysleta within the city limits of El Paso and part of Our Lady of Mt. Carmel Parish. The parish was established in 1682 and the mission completed in 1692. The Spanish originally named the church Misión de Corpus Christi de Ysleta del Sur but it also has been known as Misión de San Antonio, in honor of the patron saint of the Tigua Indians who have worshipped at the parish since its beginnings and still do today. In 1740, the Rio Grande washed the original church away and settlers began the construction of the new structure in 1744. Like the Socorro Mission, the layout of the Ysleta Mission is an example of the New Mexican style of mission churches which were built during the 17th and 18th centuries, characterized by their linear, boxlike forms, with simplicity in their exterior decoration. In 1907, the church was partially destroyed during a fire, but was reconstructed with the addition of a three-story tower incorporating traditional Spanish mission decorations. Today, the parish has nearly 1,200 registered families. Nuestra Señora de la Concepción del Socorro is located in the town of Socorro. The Socorro Mission was established in 1680 when Spanish colonizers from northern New Mexico fled the Pueblo Revolt with Piro natives and other tribes. Flooding caused by the Rio Grande River twice forced the community to rebuild the mission, the third and final building being completed in 1848. The mission, constructed of adobe surfaced with stucco, is particularly notable for its interior. The finely painted beams, or vigas, contain decorations of the original Native American builders and date from the first structure. The massing, details and use of decorative elements of the Socorro Mission show a strong relationship to the building traditions of 17th-century Spanish New Mexico. Today, the Socorro Mission belongs to La Purisima Parish, which has 660 registered families.